Window film is a great way to keep your car or home cool and energy efficient, but you may be wondering if there are any health benefits to it as well. Window film is endorsed by The Skin Cancer Foundation as an excellent way of protecting your skin from harmful Ultraviolet (UV) Rays. It's like sunscreen for your car or home, which is great because we all know that applying sunscreen as often as we should is hard to do! Living in Southwest Florida we have to be extra diligent about guarding ourselves from the sun, but with window film covering our windows we can easily block 99% of UV Rays from ever reaching us! Exposure to Ultraviolet Rays (UV) is the leading cause of skin cancer. 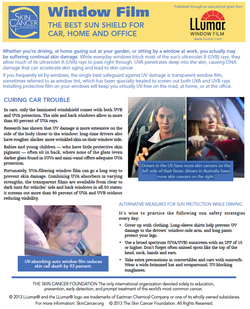 Many SUVs and minivans come with privacy windows in the back, but they don't actually block UV rays. Drivers in the US have more skin cancers on the left side of their faces: drivers in Australia have more skin cancers on the right. 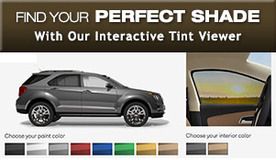 Interested in learning more about vehicle window tinting or home window tinting? 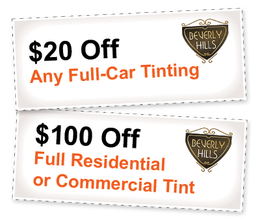 Contact us today or request a free estimate online now!